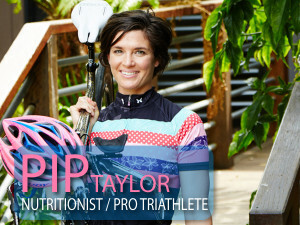 Pip Taylor is an accredited sports dietitian and professional triathlete who has written an interesting “How to” book titled, The Athlete Fix. Proper nutrition is the cornerstone of good health and critical for sports performance. Diets are typically confusing fraught with opinion and erroneous gimmickry. Pip’s book explains how avoid foods that cause inflammation and how to identify food intolerance’s by adopting a base functional diet, a process of refining your feeding strategies so that your nutrition is optimal for YOU.